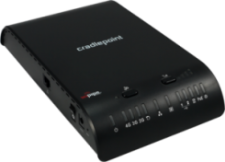 The CradlePoint CBA750B 3G/4G Mobile Broadband Adapter provides IP Pass-Through capabilities for any device that requires wireless broadband access. For most applications, simply connect the CBA750B, to an existing CPE router configured for WAN failover, and it’s ready to go. The CBA750B handles the wireless WAN connection through the integrated 3G/4G modems when failover occurs. For temporary networks, or when wired connections are impractical, the CBA750B can serve as a primary-connect device converting mobile broadband to Ethernet for point-of-sale devices, digital signs and kiosks. Engineered for day-in, day-out 24/7 Internet connectivity, Business Series products extend the benefits of WiPipe technology across the router and the modem, ensuring reliable connections when you need them. The CBA750B can also run in router mode with access to CradlePoint’s powerful suite of routing capabilities. Power-Over-Ethernet enables flexible mounting location and external high-gain antennas ensure optimal performance in areas of low signal strength.